Fusion power is a carbon-free, combustion-free source of energy that uses fusion reactions to produce heat for electricity generation—and it may well be the way we power our future lives. Read about how it works. Although, it has been the dream of energy researchers for years, fusion power remained out of reach because of the investment necessary to develop it for practical use. 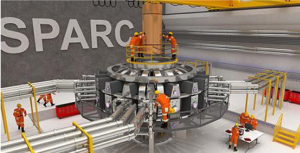 MIT has just announced, however, that it is putting fusion power on the fast track. With $50 million from an Italian energy investor, the Institute and the new private company Commonwealth Fusion Systems (CFS) are preparing to launch a rapid research program leading to the development of a working pilot plant within 15 years. The project was conceived by MIT Plasma Science and Fusion Center (PSFC) researchers Robert Mumgaard SM ’15, PhD ’15 (now the CEO of CFS), Dan Brunner, PhD ’13, Brandon Sorbom, PhD ’17, and Zach Hartwig PhD ’14, assistant professor of nuclear science and engineering at MIT. Director Dennis Whyte and Deputy Director Martin Greenwald will lead the effort, which will include a broad interdisciplinary team. See MIT Vice President for Research Maria Zuber’s op-ed in the Boston Globe. Find out more about the MIT-CFS fusion project.